Gili Air, Lombok, Indonesia 2010 Balifornian Tours www.Balifornian.com Gili Air is the nearest Gili to Lombok. It is also the most populated and you will find more trees there than the other Gili's. The local inhabitants are: Sasak, Mandar, Bugis and Makassar. You can find their unique culture that is different from Lombok and wonderful beaches. Many of the older generation still make their living as boatmen, fisherman and farming coconuts. There are only a few number of luxury upmarket hotels (rooms with air conditioning, swimming pool, TV etc) on Gili Air. Most of places to stay are located in south, west and east side of the island. The island remains quiet and relaxing making it popular with honeymoon couples and travelers seeking a quiet retreat. Most accommodations are locally owned and managed, while a few of the upmarket hotels own and managed by foreign investors. 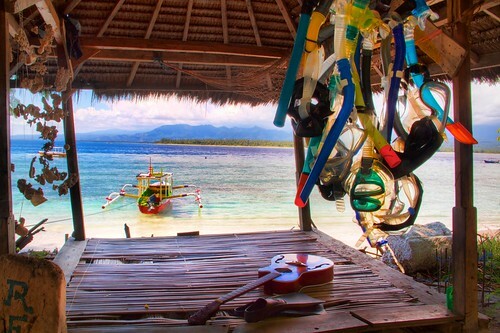 You can go from one island to another by joining the gili island's hoping boat (depart twice a day). It has population of about 1,000. The island offers excellent snorkeling and scuba diving off its east coast, and turtles can be seen along the coral reef. People here are more friendly than on Gili Trawangan. Activities Snorkeling and diving are the highlight of the activities. Snorkeling area are located in the south east (opposite-facing the Lombok Golf Kosaido) and along to the north east). You can just jump into the water to see the colorful fishes and coral reef. In the western part of Gili Air when the moon is high (low tide), you can't swim off the beach. You need to walk to the south or east side. There are few quality scuba diving operations on all the islands. There are now 3 PADI Dive Centres - Manta dive (offers SSI training as well), Blue Marlin and Dream Divers. Also offers great dive site, Hahn’s Reef, where strange critters and muck diving are the norm, it is also a superb training site for beginners. The other great spot for diving and snorkeling is Gili Air Wall where you can see anything from turtles to pygmy sea horses, quite amazing To get around the isle, the only means of transport are Cidomos, horse drawn carriages. Bicycle rentals are available too. Expect higher prices for most things there since all food and goods must be brought over from the mainland.